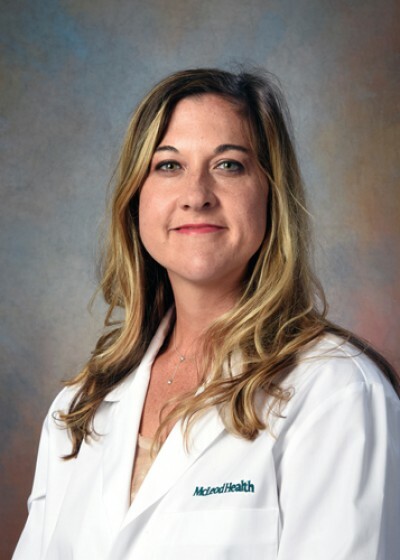 McLeod Health welcomes Megan A. Brady, MD to the medical staff. Dr. Brady joins the practice of McLeod Orthopaedics and will serve patients with orthopaedic trauma at McLeod Regional Medical Center. As a Board Certified Orthopaedic Trauma surgeon, Dr. Brady specializes in complex injuries to bones, joints and soft tissues, often sustained as a result of sudden accidents that require immediate attention. A native of Iowa, Dr. Brady comes to McLeod from Des Moines Orthopaedic Surgeons where she practiced since 2014. Dr. Brady received her medical degree from University of Iowa College of Medicine in Iowa City, Iowa. She completed her residency at Indiana University School of Medicine in Indianapolis, Indiana. Dr. Brady also completed a fellowship in Orthopaedic Trauma at MetroHealth Hospital in Cleveland, Ohio. As a state-designated “Level II Trauma Center,” the McLeod Regional Medical Center in Florence meets or exceeds requirements for staffing, specialist availability, response times, training and quality improvement. Our team includes neurologists, general surgeons, orthopedic trauma surgeons, pediatric intensivists for the McLeod Children’s Hospital, oral and maxillofacial surgeons, and plastic and reconstructive surgeons. McLeod welcomes Dr. Brady to the Trauma team. For more information, please visit www.mcleodhealth.org.